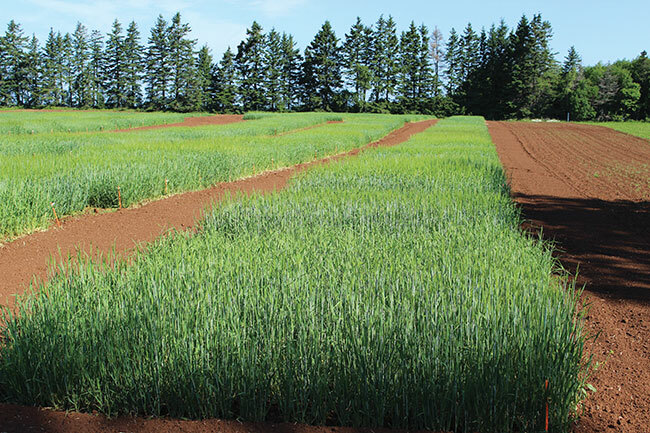 Malt barley production offers both opportunities and challenges in the Maritimes. Agronomic research, varietal testing and educational activities are underway to help growers capture the opportunities and meet the challenges. Malt barley production offers opportunities and challenges in the Maritimes. Malt barley production offers both opportunities and challenges in the Maritimes. “Looking at the opportunities, malt barley tends to be a slightly higher value crop than feed barley. The malt varieties, for the most part, are higher yielding than the feed varieties. 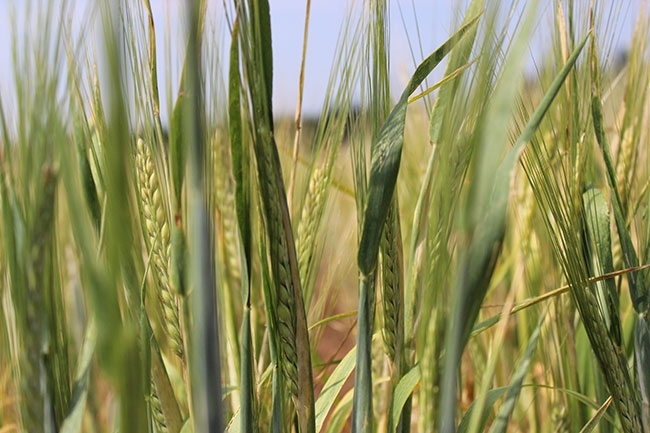 And some local opportunities are opening up for malt barley use in the craft sector, although those opportunities are small compared to the export opportunities with commodity barley,” says Aaron Mills, a research scientist with Agriculture and Agri-Food Canada (AAFC) in Charlottetown. The main challenge for Maritime malt barley growers is meeting the strict specifications for grain quality. That requires luck with the weather, along with proper production practices and good storage conditions. “To make a high quality malt, you have to start with high quality barley,” says Aaron MacLeod, the director of the Hartwick College Center for Craft Food and Beverage in Oneonta, N.Y. The Center is a resource for testing, technical support, and education for small and mid-sized breweries, malt houses, farms, and other craft food and beverage producers. Three of the main quality factors are protein content, germination and disease. “The protein content of the grain has to be in a very specific range, usually between nine and 12.5 per cent. That’s because the more protein you have, the less starch and therefore the less alcohol. So the protein content can’t be too high,” MacLeod says. Preserving the grain’s germination ability is extremely important because malting is a natural process of sprouting the grain where the only added ingredient is water, MacLeod explains. The grain should also be disease-free. “Malt barley must be free of fungal diseases and must have very low levels of fungal toxins, not only because the barley is going into a food product, but also for the barley to perform well in the malt house and the brewery,” MacLeod notes. Until Mills started his malt barley research a few years ago, very little agronomic research had been done on malt barley production in the Maritimes and the rest of eastern Canada. From 2013 to 2018, Mills led a malt barley agronomics project that took place at five sites in northeastern North America, including locations in Prince Edward Island, southern Quebec, eastern Ontario, northern Ontario and upstate New York. Funding for the project came from the Brewing and Malting Barley Research Institute, AAFC under the National Barley Research Cluster, and the Alberta Barley Commission. The project evaluated five nitrogen fertilizer rates (zero, 30, 60, 90, and 120 kilograms per hectare), two seeding rates (200 and 400 seeds per square metre), and two western Canadian malt barley varieties (Newdale and Cerveza). “Although there were differences with variety and seeding rate, the nitrogen rate overall had a much stronger effect on barley quality,” he says. Malt barley production offers opportunities and challenges in the Maritimes. Finding the optimal nitrogen rate can be tricky. You want enough nitrogen for reasonable test weights, thousand-seed weights and yields, but not so much nitrogen that the grain’s protein content and other quality characteristics are outside of their acceptable ranges for malting and brewing. “We found that the lower fertility rate was better for quality all around. It’s certainly a challenge to hit higher yields if you’re going with a lower fertility rate, but if you are targeting the malt quality then you’re going to have to go with a little lower nitrogen,” Mills notes. Mills is participating in two multi-agency, multi-site efforts to test malt barley varieties in eastern North America. One is the Eastern Spring Barley Nursery project, led by Richard Horsley with North Dakota State University. This project is evaluating the performance of modern spring barley varieties from around the world. The germination difference between the European and western Canadian varieties also shows up in the malt analysis. The western Canadian varieties germinate very quickly, while the European varieties take a little longer. The other variety testing initiative is in partnership with the John Innes Centre in the United Kingdom. Mills and other researchers have been testing 80 heritage varieties at sites in eastern North America. Both of these variety evaluation efforts are continuing in 2018. “We’re maintaining all of our Eastern Spring Barley Nursery lines. As well, we’ve pared down from 80 heritage varieties to 40, and we are testing those in our DON nurseries in P.E.I. and Manitoba and doing agronomy trials in P.E.I. and Michigan,” Mills says. He notes, “We’re generating all the numbers about how each variety performs in the field and in the malt house, to try and find the best qualities of each variety when we grow them in the East.” That way, maltsters, growers and brewers can make more informed decisions. The Center for Craft Food and Beverage suggests that growers in the East have a contract in place with a malt house before growing malt barley. MacLeod explains that the contract will specify which barley variety to grow because every variety performs differently in the malt house and the brewery. The contract will also cover the malt house’s quality specifications, like limits for protein and DON, and the price for the grain. Mills emphasizes, “Quality is the most important issue for malt barley. If the grain quality is poor, then the quality will be poor all the way along [in the malting and beer making processes], and then you will have bad beer.” And nobody wants that.